You may (or may not!) know this, but today is the first day of Passover. It doesn't always fall during Easter week, but when it does, it makes Easter a bit more meaningful to me, and, of course vice versa. There are likely more parallels between the two holidays than you may realize. 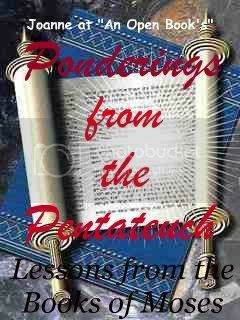 Be sure to stop my my Ponderings on the Pentateuch post at the (newly redesigned!) Exemplify this morning. Find out how this holiday "double up" is Deliverance Two Ways. Speaking of the overlapping of these two holidays, on Good Friday, my church is hosting a first century Passover dinner, put on by the Biblical Learning Center of Grand Rapids. My husband and I are very anxious to go. As we were raised in the Jewish faith, we are quite familiar with the rituals and such of a Passover Seder, but to see it from Christ's perspective I am sure will be amazing. We have been to one "Messianic" Seder in the past, but having this one set in Jesus' time will, I'm sure, add to the authenticity and poignancy of the evening. Look forward to sharing about my experiences in a few days, both here and at Exemplify! I've been to a Passover Sedar. I'd love to attend one again, now that I'm older and have learned more. Tell us all about it next week! I jumped over here from Laura Lee's blog today [where I posted a comment in reference to your testimony]. I LOVE JESUS for saving YOU!!! I also love to go to Seder dinners for Passover - because of all the hidden truths of Christ - in each and every token part of the participation ceremony. So cool how it's all right there. May the Lord Jesus Christ [our Messiah] pour down His blessings upon your life. Keep writing and sharing the TRUTH's of His Word. As a "completed Jew" - you now probably have the New Testament opened up to you on a whole new realm - where I, only in the last 3 years, have come to love every bit of the Old Testament! Both - are the fulfillment of God's eternal plan and there is no Bible without both! I will stop in again! I am privileged to call you my sister in Christ! Can't wait until my guys are old enough to sit through a Seder. We have some pretty active Messianic congregations in our area so I'm kind of missing Passover this week. Definitely post about it later. I attended a Passover Sedar many years ago and it was an enriching experience. I really enjoyed your article at Exemplify and should have commented there, too. :-) Happy Easter to you.